Make It Handmade: Gift Card Holders In 5 Minutes! Gift Card Holders In 5 Minutes! psstt... the brother 1034d serger is still on sale for 179 at Amazon. It's not too late to have Santa bring it to you this year! Using this link for any Amazon purchase helps support MIH. Although, I do love giving (and getting) handmade gifts, I made the decision last year to quit stressing myself out over making handmade gifts during the holiday season. I called it my Happy Holidays Pledge. So, when Deby asked me to participate in her Seasonal Sewing series, I knew just what I wanted to make-- a gift card holder! This tutorial appeared on Deby's blog a few weeks ago and now I'm bringing it home, just in case you missed it. This is the perfect way to add a handmade touch to an impersonal gift card. I have a special place in my heart for clever sewing construction, and I think this little gift card holder is clever! It's made out of a single rectangle of fabric to reduce the amount of sewing and turning. 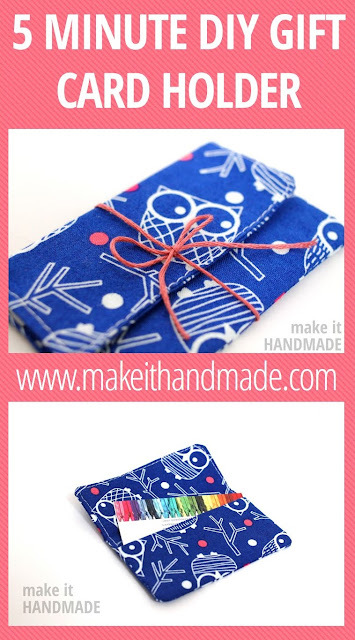 This makes it an especially quick sew for those last minute gifts. Fabric rectangle 12" by 4.5"
Now all that's left to do is turn the card holder inside out. Although you can just top stitch across the top to close the hole, I like to do the entire outside flap. Because I'm fancy. :) You can also hand sew the opening closed using an invisible stitch like the magic stitch. If you like these, you can check out some other DIY Gift Card Ideas at Make It Handmade, and also get some frugal holiday gift ideas at Sewistry.